Get ready, get set, go! You and your opponent will race against each other down the Bungee Run wearing a harness with a giant bungee on its back. The objective is to place the velcro markers at the furthest point possible before the cord pulls you back. This tropical-themed interactive game is lots of fun and is sure to have the crowd laughing with excitement. 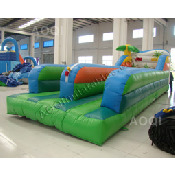 Adults and older children and youth may use this inflatable.